Located off Veterans Memorial Parkway at Kettle Point in East Providence, University Orthopedics has opened its doors with a beautiful new 88,500 square foot medical center. Kettle Point is a residential and commercial development repurposed from a former industrial site by Churchill and Banks. The University Orthopedics project was led by Michael Integlia & Company, a premier builder and developer of office, commercial, and institutional spaces in New England. The firm teamed up with NEMD Architects, Inc., EW Burman, and DiPrete Engineering on the construction of the four-story building, 395 parking spaces, drainage, and other structural improvements. 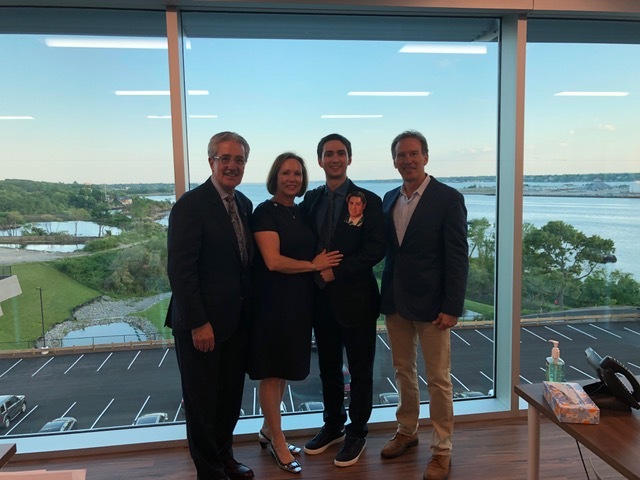 In an emotionally moving ceremony, Dr. Mark Palumbo spoke of Michael Integlia III who helped conceive the project and enthusiastically led the development team until he unexpectedly passed at 31 years old. Dr. Palumbo thanked Michael Integlia Jr. who stepped in and seamlessly completed his son’s work through a period of great emotional and personal loss. University Orthopedics dedicated the physical therapy department and gym to Michael Integlia III. The orthopedic center’s new building includes an ambulatory surgical center, exam and treatment rooms, as well as x-rays and MRIs. The new medical site also provides a network of paths, parks, and a public parking area open to both Kettle Point tenants and residents.